On 5 December, UNU-IAS and IDE-JETRO co-organized an international symposium entitled International Cooperation through Establishment of Standards and Certification System for Environmentally Friendly Products and Technologies at JETRO Headquarters. UNU-IAS Senior Research Fellow Masachika Suzuki gave a presentation on “Increasing Diffusion, Harmonization and Effectiveness of Environmental Labeling and Certification Schemes in Asia: Suggesting a Research Agenda”. He explained how labeling and certification can be beneficial in terms of creating economic value and benefits, using concrete examples from the construction sector. Dr. Suzuki stressed that the effectiveness of labeling schemes is key. He pointed out that labeling schemes tend to be limited to a specific environmental effect and stressed the importance of harmonization and the role the SDGs could play in addressing this challenge. 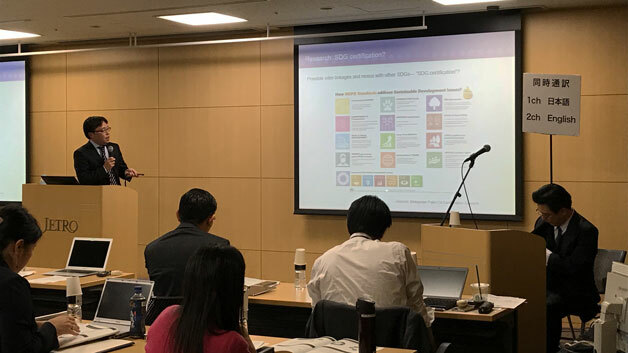 At the end of the session, questions such as the potential challenges for SDG-related labeling and how the United Nations can contribute towards an SDG-based certification system were raised; and an active interaction took place between Dr. Suzuki and the participants.